A mag 6.3 - 77km NNE of Loreto, Mexico is the fourth major quake of January and of course 2018. The U.S. Geological Survey said the quake measured at 6.3 magnitude, after initially reporting it at 6.6. 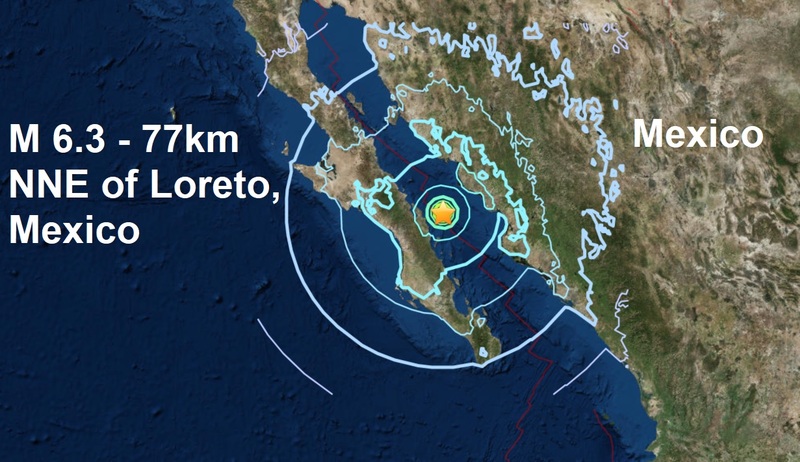 The epicentre was 48 miles (77 km) north-northeast of the town of Loreto in the state of Baja California Sur, the USGS said. The predominant vulnerable building types are mud wall and adobe block with concrete bond beam construction. Today's quake comes as another coronal hole on the Sun is ejecting solar wind towards Earth which is expected to arrive tomorrow. Mexican federal officials stated there were no known reports of damage and no tsunami risk. In September the biggest Mexican earthquake in 100 years, a mag 8.2 triggered a tsunami and caused devastation across the country.